Step by step directions are included in this envelope pillow cover tutorial, including how to finish the inside with a french seam. It’s no secret that one of my favorite ways to refresh a room is to change out the pillows. 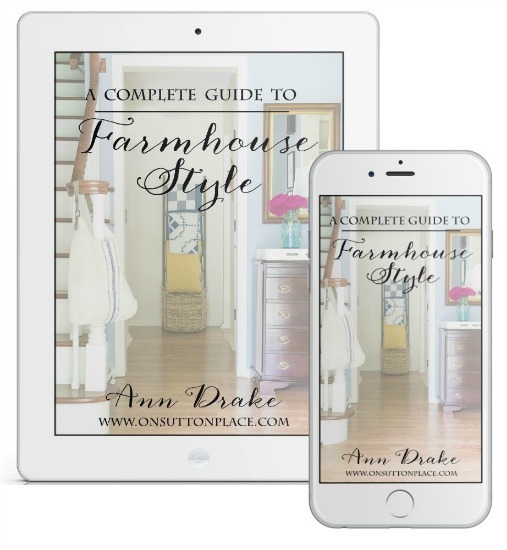 It’s fast, easy and usually doesn’t cost a small fortune. 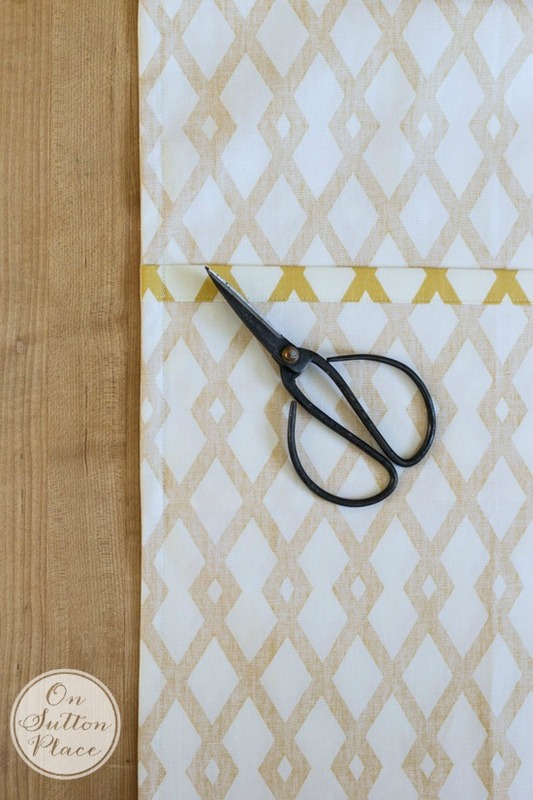 Today I’m sharing an envelope pillow cover tutorial and you don’t need any special skills. It’s straight line sewing and the measuring part is actually simple. So fire up your sewing machines and let’s get started! For two 20 x 20 Pillow Covers you will need 1 1/3 yards of 54 inch fabric. 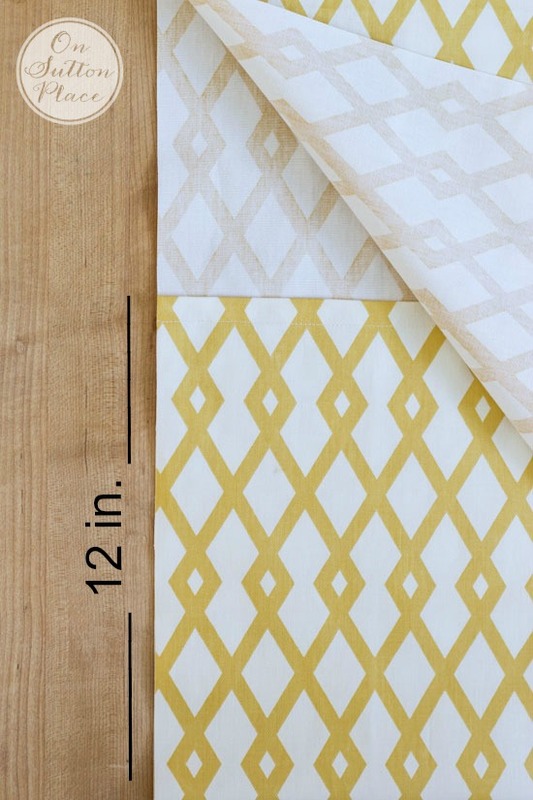 Find this Robert Allen Geometric HERE. Cut a piece of fabric 48 in. x 21 in. On your ironing board, press one of the short ends over 1/2 inch. Turn that edge over 1/2 inch again and press well. Repeat this step for the other short end. Stitch both ends. 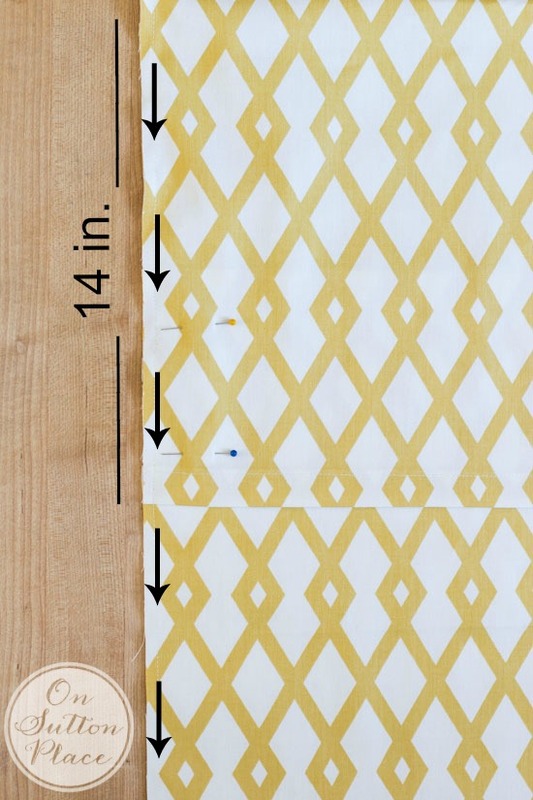 Lay your piece of fabric on a flat surface RIGHT SIDE DOWN with a measuring guide handy. If you don’t have a sewing ruler, a yardstick will do. Fold the bottom short end up 12 inches. Fold the top end down 14 inches. The top edge will overlap the bottom edge. Pin the sides together. Using your presser foot as a guide, stitch both sides of the cover a scant 1/4 in. seam allowance. (Follow the arrows.) Remember your fabric is WRONG sides together. Trim your threads and remove the pins. Turn pillow cover INSIDE OUT. Press side seams well. Now we are going to sew French seams. A french seam will ensure that all the raw edges are hidden INSIDE the side seams. By taking this extra step, the inside of your pillow cover will be finished off beautifully. Sew side seams again at 1/2 in. seam allowance. Make sure all your threads are clipped. Turn your pillow cover right side out. Press the entire cover making sure to hit the side seams well. Your final pillow cover measurement may be slightly less than 20 x 20, depending on how accurate you are with your seams. I usually wing it, so my measurements are not all that precise. No worries about the pillow cover fitting though…a slightly smaller pillow cover makes for a fluffier and fuller pillow. You now have a pillow cover that will stand up to just about anything and is nice enough to give as a gift. When I first opened my online shop this is the way I finished the inside of my pillow covers. I didn’t have a serger then and could not bring myself to sell anything with raw inside seams. A french seam is so easy and offers a big punch in taking your sewing projects to the next level. Just remember: WRONG sides together first. RIGHT sides together second. Thank you for stopping by…let me know in the comments if you have any questions about the envelope pillow cover process. So Awesome! Can’t wait to give it a try. I love French Seams more than serging. That is how I make all my pillow covers. So easy to do. Love the yellow fabric that you chose. 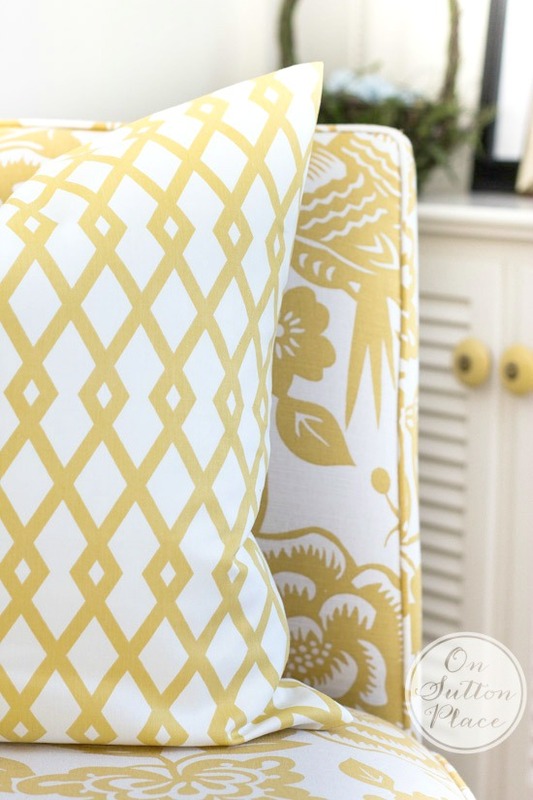 Love these pillows – but I love your yellow chairs even more! I have a pair of yellow wing-back chairs that are so dear to me. I bought them in 1979. Solid lovely, yellow – with gorgeous legs! My Sister-in-law (10 years my senior) laughed, and laughed at me. But I still love them and they still make me smile. My sister-in-law lives 2 1/2 hours away – thank goodness!! 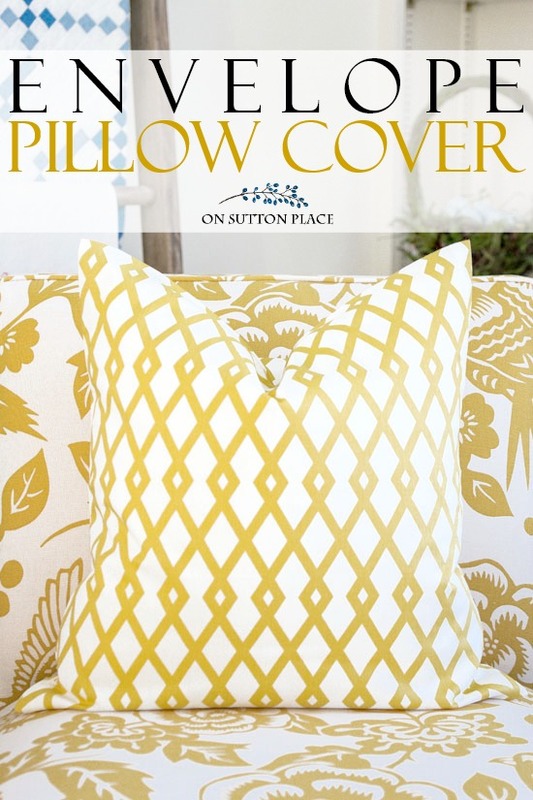 :) Thanks for sharing this pillow tutorial – I have always had a problem with pillows! That fabric is so cute! Love it! Just what this pillow-holic needed! My fear for sewing zippers initiated my research for envelope pillow covers. Let’s just say my adventures with Pinteret tutorials yielded a sizable scrap pile. giggle. Your tutorial is perfect! Honestly, within 45 minutes I was able to sew 2 new covers utilizing some Anthropologie napkins and a slight modification in the measures. Thanks so much for easy to follow instructions! If I had a machine, I’d make an attempt to make some pillows! I’m with you about freshening up for spring, and your pretty pillows do the trick! Will you share where you find your beautiful fabric? Sandy there’s a link at the end of the post. The pillow fabric is Robert Allen. It’s an amazon link but you can find it a few other places. Try fabrics.com. Enjoy! It seems like there are always messes to clean up somewhere. Thanks for your reply. Last year I bought a sewing machine. I thought by doing that I would save so much money making envelope pillow covers rather than buying pillows for the holidays and such. My first pillow covers were for St. Patricks Day. For never sewing before I did a pretty good job. Oh this made me laugh out loud. Dust off the machine and try again! I just made a throw pillow this morning and your instructions are much easier than mine. Thanks for sharing, next time I’ll be making French seams. I’m sure that is easy to make if I just wouldn’t break out in a sweat just sitting in front of a sewing machine. Just give me a paint brush and I’m good! Hi Kim! Well you are a master at painting for sure and I talk myself out of it every time. Opening a can a paint is what makes me sweat! Perfect timing! I will be teaching a class on making simple throw pillows this Saturday! Thank you for your super easy tutorial! Your still my favorite blogger! Beautiful pillows I love the tutorial. I am going to enjoy making some to “Update” our home. I so enjoy stopping by your site. I enjoy everyone of your posts. Your home is truly lovely. Thank you Lu Ann…enjoy your sewing day! Good morning Ann This is off topic, but wanted to let you know that I finally made the Cranberry Citrus Bread that you shared in December. It is easy to make, it is moist, pretty…it is delicious. Gave away some loaves as gifts and they loved it, too. Recipe is a keeper. Thanks. Beautiful pillows.Thanks for the tutorial. I need to do a spring update for myself. I am like you, I would like to have a “budget friendly” update. I need to search for some fabric bargains! Your yellow pillows are beautiful Ann, and I love your yellow chairs too, so pretty. your blue and white plates on the wall. I am a big plate user as well. Love the look. Anyway, thanks for always making your blog a fun and pleasant place to visit. Ann, thank you so much for sharing the French seam tip. I have a few pillow cover designs in mind for an upcoming vintage market that I wanted to make, but I do not have a serger and I wasn’t comfortable with the unfinished edges on the inside. I’m so excited to use your expertise to improve my sewing projects!!!! I love the blanket ladder with the beautiful blue blankets. I make this type of pillow all the time and I love how easy they are to do. I’ve been flirting with the idea of putting some fringe around the edge of the pillow. Can we have a tutorial on that, Ann? Regretfully I am not very good at trims or piping. I have tried but it just takes too much time…especially piping. I’m not sure how to accomplish the french seams with trim either. I would have to think about that one! 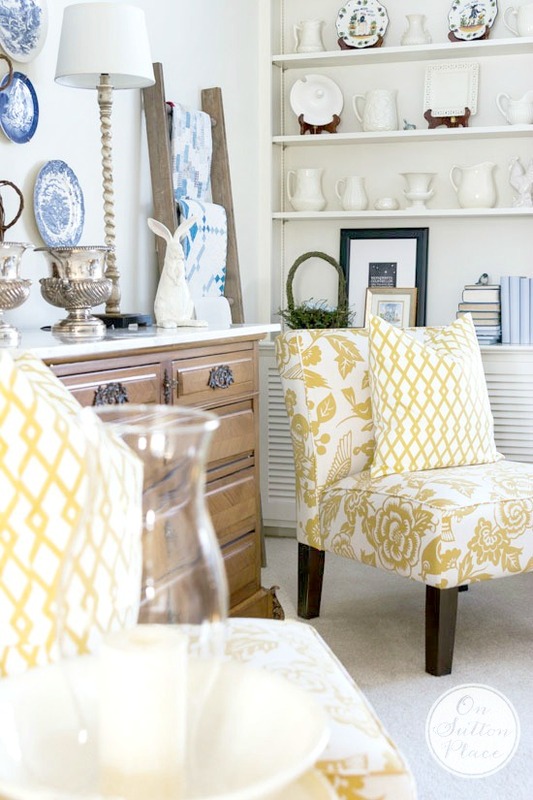 Great tutorial Ann…love that pillow and must say I so love seeing that corner of your room…always so bright and beautiful…love the blue and yellow!! Have a great day! Pinning! Hi Ann! 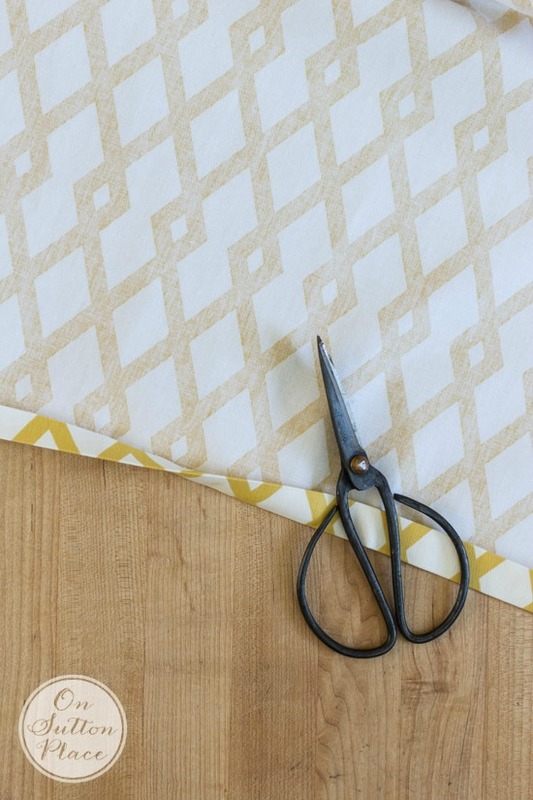 Your fabric choices are beautiful, and I so needed this tutorial! About a year ago we bought a beautiful long bench at a resale shop and I’ve always envisioned it with lots and lots of pillows:) Thank you for sharing! Love your pillows Ann! I’m a pillow girl too. I love changing them out for the seasons and also that they don’t take much fabric! Great tutorial all the way around, but particularly the part on French seams. They can be so intimidating to new sewers but they are really easy and as you say, five such a professional look! I finally had time to do something crafty this past Sunday, and I really wanted to make pillows like this. Alas, I didn’t know how. So, I made the pompom Christmas pillows (hey, I’m early for Christmas – not late.) I will be doing this next Sunday! On another note, I want to embroider initials on some linen that I have. I can’t find any pre-made iron-on patterns that I like. (Walmart and JoAnns are my only local options.) Any suggestions? Hi Suzie! Since I’m not exactly sure what you are looking for it’s hard for me to help. I did a quick google search with the words “initial embroidery iron on pattern” and several good links came up right on the first page. Maybe you could find something online this way? Good luck! Nice tutorial Ann! I love changing my look with throw pillows. I always enjoy how you change the appearance of you decor! Definitely go for it Mary! Thank you so much for this tutorial. I have been wanting to offer pillow covers at the local craft fairs and art shows I’m starting to attend but didn’t want to put out something that I felt was less than perfect (stringy seams!). I, too, can’t invest in a serger so this is the perfect solution.